If you're trying to lose weight, you're probably searching for the best ways to cut calories from your diet. Using no-calorie sweeteners instead of sugar may help you create a calorie deficit. But should you use artificial sweeteners for weight loss? Some dieters worry that artificial sweeteners cause weight gain, not weight loss. And many healthy eaters are concerned about artificial sweetener safety. Many consumers are concerned about side effects of artificial sweeteners. But the issue of sweetener safety is highly controversial. So if you want to know if artificial sweeteners are safe, the answer will probably depend on who you ask. Some high-intensity sweeteners are safe for consumption by the general public, according to the FDA. These include saccharin, aspartame, acesulfame potassium (Ace-K), sucralose, neotame, and Advantame. The FDA also considers highly-purified steviol glycoside (Stevia) to be generally recognized as safe (GRAS). 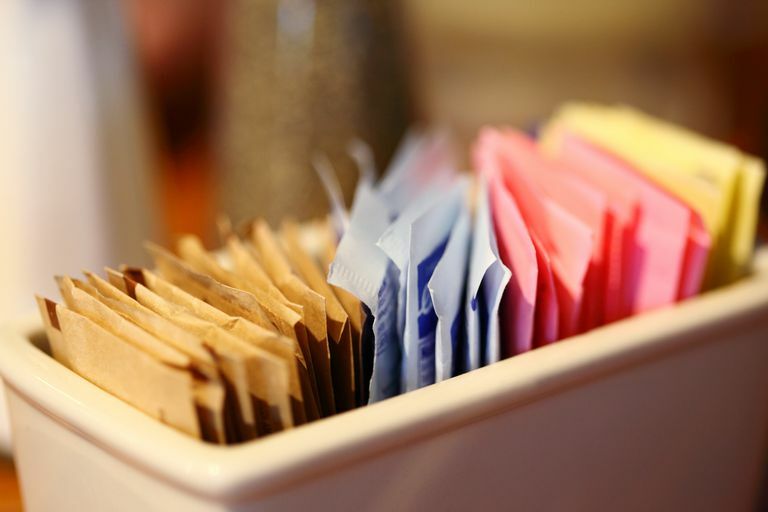 So which sweeteners might be unsafe? In the United States, the FDA prohibits the use of cyclamate even though the sweetener is used in other countries. And whole-leaf and crude Stevia extracts are also not permitted for use as sweeteners. If you have a condition called phenylketonuria (PKU), your body may not react well to aspartame. For this reason, the FDA says you should avoid or limit foods and drinks that contain aspartame. But even though the FDA has determined certain products are safe for you to use, many health experts are still unconvinced. Some dieters even say that they experience side effects with artificial sweeteners. Dr. Bruce Y. Lee, MD MBA, Associate Professor of International Health and Director of the Global Obesity Prevention Center at Johns Hopkins University in Baltimore, MD, is one of those experts. According to Dr. Lee, dieters should be concerned about sweetener safety even if they are generally recognized as safe. "I would recommend being cautious about artificial sweeteners. Newly introduced sweeteners haven’t been around long enough for long-term studies on health risk," he says. And other experts express greater concern. Dr. Larry Goldfarb, DC, founder of Medical and Wellness Center of New Jersey, claims that there were political and financial motivations behind the approval of certain sweeteners. "The public has been duped that artificial sweeteners are fine to use and no harmful effects have been shown to exist. Research has shown just the opposite," says Dr. Goldfarb. Dr. Goldfarb also notes that some studies have shown a relationship between aspartame and several serious diseases including cancer. But the FDA stands by their safety rating, stating "aspartame is one of the most exhaustively studied substances in the human food supply, with more than 100 studies supporting its safety." Even if you're not concerned about the safety of the sweeteners, you may not want to use them for weight loss. Some dieters - and experts - believe that using artificial sweeteners may cause weight gain, not weight loss. For years, researchers have been studying the way that our bodies and our brains react to low-calorie or no-calorie sweeteners. Some studies have found that when we consume these sweeteners, we end up eating more food and consuming more calories overall. The result? We gain weight instead of slimming down. So why does weight gain happen? Some scientists believe that because artificial sweeteners are so much sweeter than sugar, they train our brains to crave increasingly sweet foods. In addition, because these sweeteners do not provide calories, they confuse normal brain signals that tell us to stop eating when we've had enough food. Other scientists think that eating artificially sweetened treats gives us an excuse to eat more food overall. For example, if you buy diet cookies you might be tempted to eat more of them because you might think that they do less harm to your weight loss program. As a result, you may consume more calories overall. But not all research studies have shown negative effects from artificial sweeteners. Some researchers have found that when dieters replace high-calorie foods and beverages with lower calorie or no-calorie sweetened treats they cut calories and lose weight. One researcher said that the results are most dramatic when switching from high-calorie sodas to diet sodas with no calories. So where does this leave you as a dieter? Scientists say that trying to study eating behavior is too complicated to give exact answers. Even if a study says that artificial sweeteners may work for weight loss, your experience may be different. So to find the best plan for your health and well-being, you may want to think about how you use artificial sweeteners in your diet. Should You Attempt to Use Artificial Sweeteners for Weight Loss? If you currently eat a lot of foods with sugar, swapping them for foods with artificial sweeteners may be a reasonable first step. This process may help you become more thoughtful about your food choices and more careful about your meal planning. "Ideally, it is best to cut down on all sweeteners as much as possible. But not everyone can do that," says Lee. "So, if there aren’t other options, then you could consider temporarily moving to artificial sweeteners from sugar. But again, ultimately, it is better to eventually move to natural means and reduce sweeteners in general." Becoming mindful of your cravings and food choices might help you to reduce your dependence on sweeteners. For example, you might crave a sweet soda or coffee drink in the afternoon to boost your energy levels. But even if you grab a diet drink with no calories, you may do more harm than good. A caffeinated beverage dehydrates your body which can cause fatigue. Drinking water instead boosts hydration, may improve your energy level, and provides zero calories. Dr. Lee reminds dieters that a sweet tooth is a learned phenomenon. "Like any habit, you can re-train yourself," he says. Eat half of what you want and eat slowly. You will feel full if you eat slowly and then resist the temptation to finish the plate of food just because it's there. Eating more slowly helps your belly and your brain respond to the food that you've consumed. Many dieters call this "mindful eating" and find that it is one of the best ways to cut back on sugar and portion sizes in general. Give yourself a deadline. Reduce your sugar intake over a two-week period and then just stop. You'll be surprised how easy it is. Cutting back on sugar will also give you room in your calorie budget to enjoy more nutritious diet-friendly foods. Reach out to experts if you can't cut sugar on your own. Seeking the care of a dietician or nutritionist may be a good place to start. Artificial sweeteners may help some dieters lose weight. But many experts remain concerned about side effects and weight gain. So try to choose naturally sweet foods like whole fruit to satisfy your sweet tooth and take advantage of the vitamins, minerals, and other benefits that whole foods provide. And reach out to your healthcare team if you are concerned about side effects of artificial sweeteners or need help cutting back. Bellisle F, Drewnowski A. "Intense sweeteners, energy intake and the control of body weight.. " European Journal of Clinical Nutrition June 2007. Gardner C. " Non-nutritive sweeteners: evidence for benefit vs. risk. " Current Opinion in Lipidology February 2014. Anne Raben, Tatjana H Vasilaras, A Christina Møller, and Arne Astrup. "Sucrose compared with artificial sweeteners: different effects on ad libitum food intake and body weight after 10 wk of supplementation in overweight subjects. " American Journal of Clinical Nutrition October 2002. Roberts JR. "The paradox of artificial sweeteners in managing obesity. " Current Gastroenterology Reports January 2015. Vasanti S Malik, Matthias B Schulze, and Frank B Hu. "Intake of sugar-sweetened beverages and weight gain: a systematic review. " American Journal of Clinical Nutrition August 2006.